More than 80 artists have been confirmed for the 2018 instalment of American electronic and hip-hop festival HARD Summer, which takes place between 4th and 5th August at The Speedway in Fontana in Southern California. The line-up also includes performances from TOKiMONSTA, Dirtybird artist FISHER, Louis The Child and recent DJ Mag North America cover star Porter Robinson, who’s performing as his new side project, Virtual Self. In addition to performances from house legends Kerri Chandler and Felix Da Housecat, the line-up also includes several b2b sets and collaborative performances including Diplo b2b Dillon Francis, Zeds Dead b2b Jauz, Kill The Snails (Kill The Noise and Snails), A-Trak b2b Baauer, Borgore b2b Getter and others. Outside of electronic music, the line-up also features a hip-hop-heavy roster, which includes Rick Ross, Lil Xan, Lil Skies, Trippie Redd, a headlining set by Travis Scott and more. HARD Summer returns to The Speedway in Fontana this year after a last-minute venue change in 2017 just weeks ahead of the event. The return to The Speedway sees HARD Summer partnering with the production and medical teams of Los Angeles-based mega festival promoters Insomniac Events, the team behind EDC Las Vegas, and promises new stages and a brand-new stage layout, improved logistics, increased health and safety services and more amenities for the 2018 instalment. 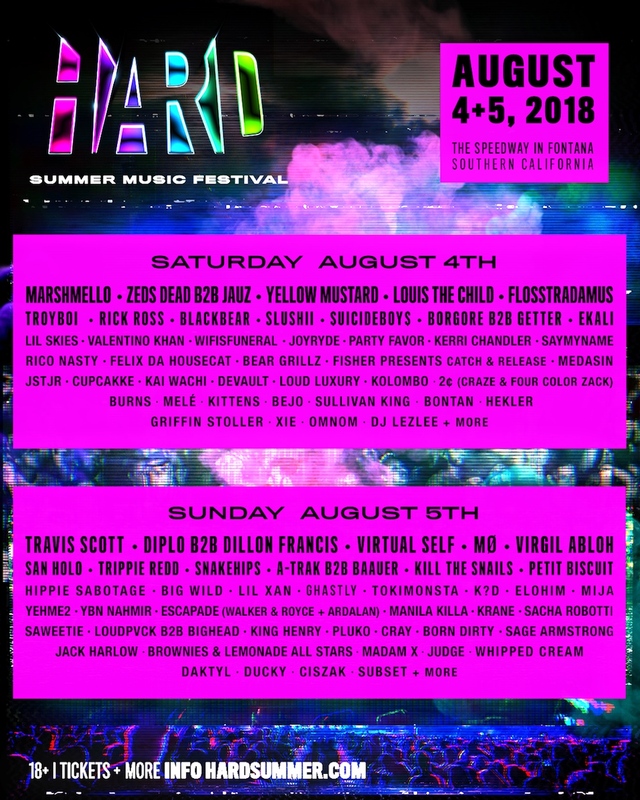 View the HARD Summer 2018 full line-up and official trailer below. Tickets go on sale Friday, 27th April, at 9am PDT/noon EDT/5pm BST/6pm CEST. For more information on and tickets to the festival, visit the official website. Relive a decade of HARD in these 10 incredible moments according to former HARD head honcho Gary Richards, aka Destructo.